BlackBerry App World Updated | BlackBerry Blast! 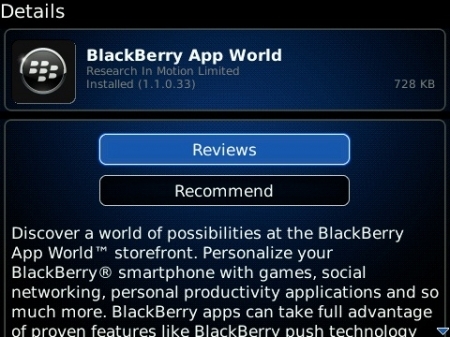 RIM has updated their BlackBerry App World to version 1.1.0.33. It's been awhile since RIM saw fit to update the App World and it's interesting that there is no changelog for the update. Therefore, we don't know what issues were addressed in the update, but you can get the updated App World at RIM's web site (see link below), or directly from the App World on your BlackBerry device.